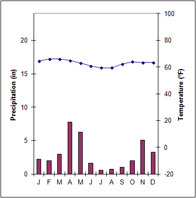 Introduction: Tropical savannas or grasslands are associated with the tropical wet and dry climate type (Koeppen’s Aw), but they are not generally considered to be a climatic climax. Instead, savannas develop in regions where the climax community should be some form of seasonal forest or woodland, but edaphic conditions or disturbances prevent the establishment of those species of trees associated with the climax community. Seasonal forests of the tropics are also widespread and vary along a latitudinal/moisture gradient between the tropical broadleaf evergreen forest of the equatorial zone and the deserts of the subtropics. The word savanna stems from an Amerind term for plains which became Hispanicized after the Spanish Conquest. Vegetation: Savannas are characterized by a continuous cover of perennial grasses, often 3 to 6 feet tall at maturity. They may or may not also have an open canopy of drought-resistant, fire-resistant, or browse-resistant trees, or they may have an open shrub layer. Distinction is made between tree or woodland savanna, park savanna, shrub savanna and grass savanna. Furthermore, savannas may be distinguished according to the dominant taxon in the tree layer: for example, palm savannas, pine savannas, and acacia savannas. Climate: A tropical wet and dry climate predominates in areas covered by savanna growth. 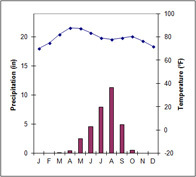 Mean monthly temperatures are at or above 64° F and annual precipitation averages between 30 and 50 inches. For at least five months of the year, during the dry season, less than 4 inches a month are received. The dry season is associated with the low sun period. Soils: Soils vary according to bedrock and edaphic conditions. In general, however, laterization is the dominant soil-forming process and low fertility oxisols can be expected. East African savannas are typically, perhaps stereotypically, acacia savannas. Many survive in the famous game parks of Kenya and Tanzania, and also those of Zimbabwe, Botswana, South Africa, and Namibia. The savannas are actually a mosaic of communities controlled (and today managed) by fire and grazing pressures. The famous Serengeti Plains in Tanzania are a grass savanna developed on droughty but nutrient-rich volcanic sands. The llanos of the Orinoco basin of Venezuela and Colombia are grass savannas maintained by the annual flooding of the Orinoco and Arauca rivers and their tributaries. The long periods of standing water inhibit the growth of most trees. Brazil’s cerrado is an open woodland of short-stature, twisted trees. It is species-rich, second only to the tropical rainforest in plant diversity. There are many endemic species, and several plants have adaptations to tolerate the high aluminum content of soils resulting from laterization on the ancient Gondwanan Shield of South America. The pine savannas of Belize and Honduras, in Central America, occur on sandy soils. Waterlogged conditions occur when the A-horizon of lateritic soils is exposed to the atmosphere. Alternating wet and dry seasons and baking by the sun create a brick-hard layer impermeable to water. This usually red hardpan is called a laterite (from the Latin for brick). During the rainy season, there is standing water above the hardpan for several months, preventing the establishment of most tree species. During the dry season, the laterite prevents penetration of roots, also inhibiting the growth of most trees. Several species of palms do tolerate these conditions and, along with grasses, occur above laterites. Droughty substrates, such as quartz or volcanic sands, also inhibit the growth of most trees. The pine savannas of Central America are examples of savanna vegetation developed on droughty, low-nutrient conditions of quartz sands; the grass savanna of the Serengeti–with its herds of large mammals–is virtually treeless. Low-nutrient soils. The cerrado of Brazil occupies a broad expanse of the Brazilian Highlands that, were it not for the low-nutrient level of the heavily-leached soils, would be occupied by a seasonal forest. Fire subclimaxes. Two groups of plants that are pre-adapted to survive fire become dominant in areas where burning is frequent and periodic. Such fires have both natural and human origins. The savannas of South east Asia are generally considered to be man-made. Perennial grasses have underground stems or rhizomes and so their growth nodes are protected by the soil during a ground fire. Trees and shrubs–with renewal buds above the surface–are selected against by fire and the balance tips toward the grasses. Grazing subclimax. Large mammals such as the elephant open woodlands by debarking the trees and by knocking them over. This opens the woodland to grass invasion and attracts a variety of grazing animals, including zebras, wildebeest, and the diverse antelopes of the Ethiopian province. Grazers will both eat and trample tree seedlings, inhibiting the regrowth of the woodland. Only well-armed species of shrubs and trees can establish themselves in the clearings, leading to thickets of thorny acacias. Protected in the thicket, some acacias and other thorny trees will grow to mature specimens. Overgrazing: if a grass savanna is overgrazed, patches of bare ground will be created. The grassland will not longer carry a ground fire and invasion by trees becomes possible. The bare ground will suffer from increased evaporation and a dry microhabitat quickly develops. Well-armed, drought-resistant species like the acacias tolerate both grazing and drought, so again an acacia savanna can become established. Fauna: The world’s greatest diversity (over 40 different species) of ungulates (hoofed mammals) is found on the savannas of Africa. The antelopes are especially diverse and including eland, impalas, gazelles oryx, gerenuk, and kudu. Buffalo, wildebeest, plains zebra, rhinos, giraffes, elephants, and warthogs are among other herbivores of the African savanna. Up to sixteen grazing and browsing species may coexist in the same area. They divide the resources spatially and temporally; each having its own food preferences, grazing/browsing height, time of day or year to use a given area, and different dry season refugia. The species-rich herbivore trophic level supports a diverse set of carnivores, including cats (lions, leopards, cheetahs, servals), dogs (jackals, wild dogs), and hyenas. Most herbivorous mammals of the open savannas are herd animals, often organized into groups of females and their young with a single dominant male and groups of bachelor males. In South America a distinct savanna fauna is not well-developed. The capybara, the large semi-aquatic rodent, is associated with the llanos, but is found elsewhere and in other vegetation types as well. Indeed, few if any neotropical mammals are restricted to the savannas. The highest diversity of mammals is found in the dry or seasonal forests. Similarly, most bird species are not restricted to savanna-type habitats. 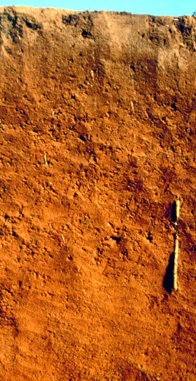 Termites are especially abundant in the tropical savannas of the world, and their tall termitarias are conspicuous elements of the savanna landscape. These detrivores are important in soil-formation; their termitaria provide shelter for other animals; and they are the beginning of the food chain for anteaters (Neotropical endemics) and aardvarks and pangolins (Ethiopian endemics). Note: This page has been translated into Ukrainian by Olena Chervona at https://all-guides.com/publications/tropichni-savani.html and into Serbian by Branca Fiagic (https://www.lawmix.ru/blog/2018/04/03/tropical-savannas/). Batar Ulanov has translated it into Mongolian at http://www.readfootball.com/edu/xaluun-orny-heer-tal.html. A Russian translation by Mary Davidson may be found at https://edu-helper.org/p20/.